People are really very interesting about their need for their 'personal space'! In a fantastic new office, (designed by Prakash Nair and FNI) we have placed several peripatetic staff, attendance officers, educational psychologists, facilities co-ordinators, ICT technicians, senior eduation staff - all of whom are 'on the road' the vast majority of the time. The office comes equipped with small bookable meeting rooms, for confidential phone calls, meetings etc, a conference room, cafe area, video conferencing and a totally 'wireless' environment. 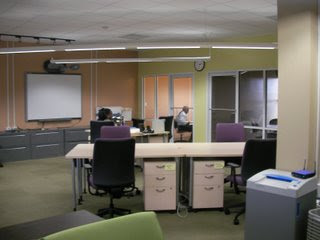 It also has formal working areas (on movabe tables - not desks) and informal meeting spaces on sofas etc. For personal storage they have lockable pedestals on wheels and secure filing faciities. All tables are movable for total flexibility of space allowing all sorts of functions from meetings to training to take place. With so many staff on the road so much of the time it makes little value for money to give everyone an individual office which stays empty most of the time. By having a flexible hotdesking environment staff can come and go as they need, just sitting somewhere and turning on their laptop - even the printer is wireless. If necessary they just have to wheel their pedestal to a new location. Some people love it, some have got used to it and some hate not having their own space for photographs, flowers, plants, paper racks and other 'stuff' laid out. Inevitably people have preferred locations or tables but a few get quite worked up if someone else is sitting there or if a meeting is taking place - there are always other spaces that they can work at. I am frankly surprised that professional people who admit it makes no sense value wise to give everyone offices, then argue that they need their own 'untouchable' space even though they are there so little. Perhaps it is because the space is so new and they need to get more used to it. Perhaps we have challenged their comfort zone too fast. Whilst there are people in the system who have stressed that they would love to move there as it is such a flexible space, not everyone is convinced. Before anyone else asks - this is not a gender thing - male and female staff both like it or are not sure about it. It just makes sense to me and I really don't understand the personal space thing for such a short period of each day/week! 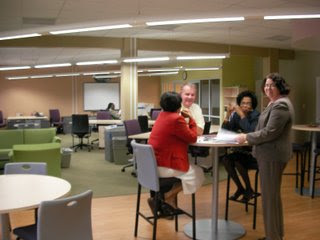 The office design is just great and the design will be reflected in the education support staff areas of the new schools we are building. The basic message though is that, frankly, we must model our own ability to be flexible in our working habits before as we ask teachers and students to do just the same! I think that having your own dedicated desk in the office is part of a sense of belonging, but I can understand how creating a mutual space can be beneficial creatively too! Workplace Qualifications - whats the problem? Empty Landscape .... or the future? Aren't you taking any clothes?